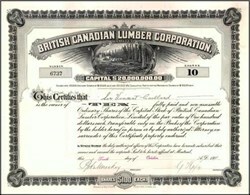 Beautifully engraved certificate from the British Canadian Lumber Corporation issued in 1911. 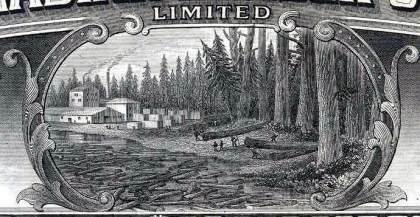 This historic document has an ornate border around it with a vignette of a lumber processing facility. This item is hand signed by the Company’s President ( Robert Mackay ) and Secretary and is over 82 years old. The certificate was issued to Sir Sir Vincent Caillard. ROBERT MACKAY 1840-1916 by "Canadian Who Was Who 1875-1933 vol. 1"
MACKAY, ROBERT, financier, and philanthropist, son of Angus and Euphemia Mackay, was born in Caithness, Scotland, February, 1840. In 1856 he was brought to Canada where he completed his education in Montreal, and started his career in the firm of Henry Morgan & Co. His uncle, Joseph Mackay, had established the well-known house of wholesale drygoods merchants, Mackay Brothers, with Edward Mackay as his partner. They had enjoyed the most cordial business relationships with the retailers of Montreal and the more distant provinces, and their undertaking had grown with incredible rapidity. In order to keep the business in the family they admitted their three nephews to the firm, Hugh Mackay, James Mackay and Robert Mackay. Robert's early training at Henry Morgan's naturally proved a valuable asset, and in the course of time he undertook the whole responsibility of management himself. In 1893 Robert Mackay was the only surviving representative of the house. The management of the enormous Mackay estates and the demands of social and public life on his time decided him to wind up the business before his sons were of age to replace him. His retirement from the active pursuits of commerce did not by any means imply that he had turned his back on the business life of the community. Far from it. As a director and adviser he interested himself in every type of industrial and financial enterprise. By 1912 there was a semi-oflicial list of no less then thirty-six companies, all of, the greatest importance, of which he was either a director, vice-president, or president, among them being the Bank of Montreal, the Canadian Pacific Railway, the Bell Telephone Company and the Sun Life of Canada. For the remainder, rails, iron, coal, steel, light, heat, power, textiles, paper, flour, construction and trsnsportation all claimed his interest and asted his advice. From 1896 to 1907 he was chairman of the Montreal Harbour Commission. For years he was a member of the Montreal Board of Trade. In 1900 he was elected president of that body, and in 1905 he voted against the exclusion of the press from the board's deliberations. The Montreal Standard discussing the situation of the Dominion in 1907 referred to him as one of the twenty-three men at the basis of Canadian finance. This was not surprising consideriag the diversity and importance of his activities. In 1912, he was President of the Herald Publishing Company, the Canada Radiator Company, Sprague's Mercantile Agency, The British Canadian Lumber Corporation and the St. Jerome Power & Electric Light Company. He was also a promoter of the Franco-Canadian Steam Nav. Company. Also he was President of the Montreal Harbour Commission (1896-1907), Montreal Board of Trade (1900-1901), where he voted against the press being excluded from the meetings. President of the Montreal Reform Club (resigned 1906). In charitable works the family is chiefly remembered in connection with the Mackay Institute for the Protestant Deaf Mutes, which was originally founded by Joseph Mackay. But this was only one of the philanthropies undertaken by Mackay, for he was most reticent in the matter of donations, avoiding anything in the nature of ostentatious publicity. He was a governor of the Montreal General Hospital, of the Western Hospital, and of the Notre Dame Hospital, the largest French Hospital in Canada. There is little doubt that the city of Montreal owes more of its advantages to the sturdy band of Scots who flourished at the end of the nineteenth century than to any other race. Drummonds, Frasers, McGills, Macdonalds, Anguses, Mackays (to mention only a few of the names) all the clans were ably represented, and there is no part of the business or cultural life of the metropolis which does not owe much to Scottish industry and generosity. Mackay was one of the last of that illustrious band and he guarded with pride all the traditions of Scotland. He was at one time President of the St. Andrew's Society, which preserved all the customs of the Highlands. In 1900 he was made an honorary lieutenant-colonel of the 5th Regiment of the Royal Highlanders of Canada, and took the keenest interest in all its activities. He was elected vice-president of the Dominion and Province of Quebec Rilfe Associations, and donated a trophy for competition between the regiments of the city at the Caledonian Games in 1901. In politics he was a strong and consistent Liberal. Though he was unsuccessful in contesting the seat for Montreal West in the general elections of 1896 and 1900, he represented the party honourably, and acquitted himself with destinction in a strongly Conserwrtive constituency. In 1901 he was called to the Senate by Lord Minto and he remained there for the rest of his life, lending his powerful assistance unobtrusively to the councils of the Upper Chamber. His duties towards religion were discharged with the same method and regularity which characterized his business dealings, and Crescent Street Presbyterian Church found in him a strong supporter, a conscientious member, and a devoted elder. He died in Montreal an 16 December, 1916, and was buried in Mount Royal Cemetery, in the presence of a most notable assembly of mourners. Senators, Members of Parliament, prominent industrialists and financiers, and at the Church session all came to pay a last tribute to their stalwart friend. Makay was married in 1871 to Jane Baptist, daughter of George Baptist, of Three Rivers, Que. She bore him eight children of whom and Hugh Makay, K.C., Edward Mackay, Mrs. Robert Loring and Senator Cairine Wilson survive.